Our mission is building better futures one story at a time. We live this out in every aspect of our business so when we welcome new clients, we want to ensure they feel part of the family and celebrate them as they get behind the mission. As our box describes, we went back to our Latin American roots to bring the tradition of welcoming others with food and drinks to our workplace, as the breaking of the break brings a sense of community and supports our familial spirit. 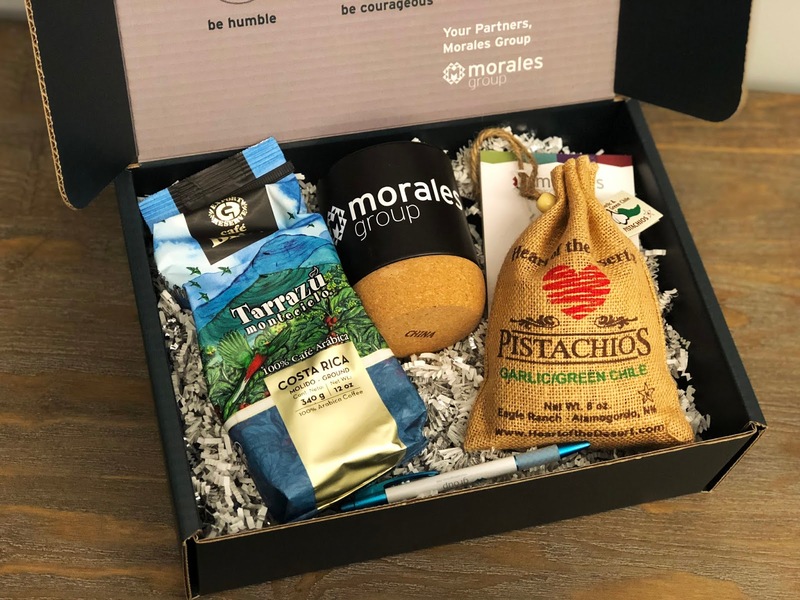 In the box we include garlic and green Chile pistachios, ground coffee from a variety of Latin American countries, a branded coffee mug with a cork bottom, and a nice pen along with a branded sticky notepad. Every single gift is also accompanied by a handwritten thank you card. We hope these unique items show our appreciation for their support and partnership. It’s a small touch and for us, it sets the tone of our partnership and opens the opportunity to better engage better with our clients. The boxes display our company colors in the designs, letting our clients feel part of the morales group.